In this article we will create Custom HTML helper for Radio Button with Model Binding to render radio buttons. We have created a separate folder named CustomHelpers to hold Custom HTML Helpers. 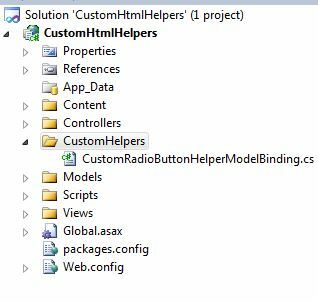 We have created a class named CustomRadioButtonHelperModelBinding which will contain code to render radio buttons. //Fetching the metadata related to expression. This includes property name, model value etc. //Fetching the property name from metadata object. //Created a StringBuilder object to hold the html markup as string. //Iterating over list from model. //Creating new radio control for each item in list. //Creating new label control for each item in list. //Setting the input type to radio to render radio button. //appending the label string to string builder object. //appending the radio string to string builder object. 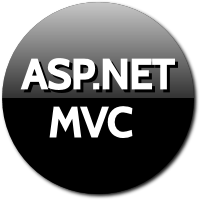 The above class is static class contains a static method which is extension method. This method accepts linq expression as parameter. The property name is fetched from the linq expression. The property name is used to group the radio buttons. The list from model is used to render the radio buttons. We have created a object of StringBuilder class to hold the strings of label and radio button. We have used TagBuilder class to create both label and radio button control. The list fetched from model is iterated and for each item in the list the label and radio button is created and the string is added to StringBuilder object. Thus for all the values in the list the label and radio controls are created. We have created a property named players. We will set this property with list in controller as shown below. We have created object of ViewModel i.e. Register. We have also created a list of type SelectedListItem and assigned to players property of ViewModel. This property is then used on view as shown below.